He is opening a new restaurant in Mauritius and he will be accepting payment in steem or SBD. PMC Grill and Resto @progressivechef believes will be the first restaurant to do so. I am sure there are a good number of restaurants around the world that take bitcoin or even other alt-coins like litecoin, but I suspect the PMC Grill and Resto may well be one of a very small number of restaurants in the world running on steem. This got me thinking where else can you use steem or SBD in the 'real world'? I'm not a cryptoconomist but I'm guessing if steem and SBD had some wider use beyond the steem blockchain then demand would go up and then presumably the price would follow likewise? Everyone would be happy with that. EINSTEIN Kaffee Bistro in Potsdam, Germany - does anyone know if this is still open? A couple that caught my eye included Ballistic Bodyboards and Finna Tour & Travel. While many sites have an easily recognisable 'bitcoin Accepted Here' logo I haven't seen anything similar for steem. We definitely need one. It is very encouraging to see all these developments. 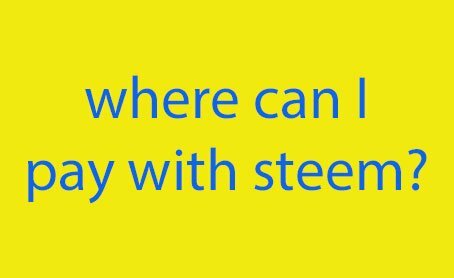 It is still very early days for widespread use of steem in the 'outside world'. Is it a good thing for steem to be used outside of the steem blockchain? Would you want to buy products in the real world with steem? If you have a business or offer some sort of service would you be prepared to take steem? On this last question I have thought about it as I have business. And why not. Yes I would take steem for payment for our work. (It is web design and application development by the way). If anyone knows of any other real world businesses that take steem or SBD as payment please do add in the comments below. I will compile them into a fuller post if there is sufficient demand. We've made it - 6 months self sufficient in vegetables - what target for next year? A Directory of Homesteading Skills, Knowledge and Expertise on steemit - contributors wanted? The Truth about Wales - scary statistics revealed. How can we improve the retention rate? SteemTowns - connecting the virtual with the reality - would it be possible? I will be interested to see if more steem places pop up. I will be interested to hear more about how taking steem on your etsy shop works out for you. Might as well go through the steps of converting it to cash at that point. It could be a close call depending on fees, but I wouldn't disagree with that. Canada you can only use BTC, at a few restaurants and shops, and one hotel chain. Apparently pleasant hill grain.com also accepts BTC as payments also, it is a gardening homesteading website. Does not hurt to try my friend. We could email them and ask! That would be cool if you could email them - I would be very interested to see how they reply. I think in the future we will see more places accepting Steem or SBD. We are still on our infancy. We have to learn to crawl before we can run. I hadn't realized so many places were accepting cryptocurrency in the brick-and-mortar world! Thanks for the interesting topic as u are right the more outsider business accept the better for us but I think we should do something as community like announce that if 2 online stores for example one accept steem and the other not we email the other that we are interested in their products but meanwhile we have to buy from their comparators coz they accept steem! At this moment as business who cares not to lose that much of buyers they would start considering it!